It is my honor to introduce Potted Pretties today. 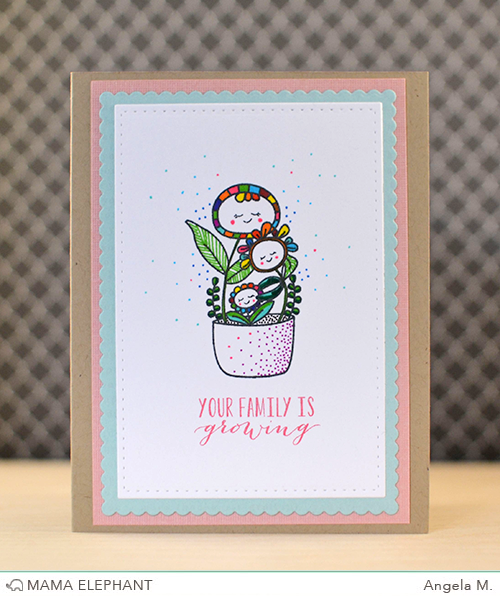 Potted Pretties is designed by our super versatile designer Elena Roussakis. When Elena first submitted the design, I was like "WOW, THIS IS GREAT! LOVE IT!" We hurried to get this into production! I love how the plants are quite unique and playful, it exudes whimsy and charm! Potted Pretties is coming just in the nick of time -- HELLO SPRING! 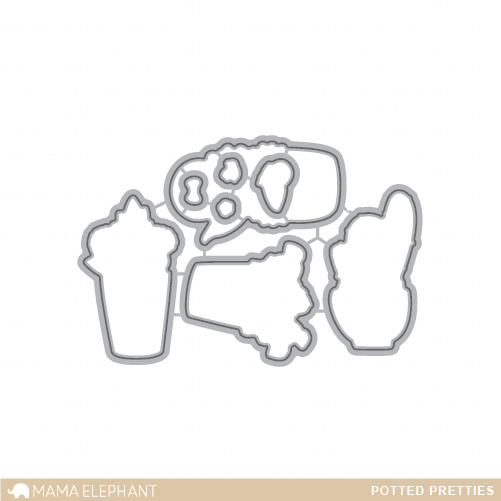 "I am so excited to be illustrating for Mama Elephant again! These potted pretties were inspired by Anne Geddes' garden photographs. With plenty of whimsy and personality, and sentiments that work for a variety of occasions, these sweet plants are perfect for spring, but will carry you throughout the year." Her coloring really is impeccable, isn't it? Visit ELENA'S BLOG HERE to see the rest! 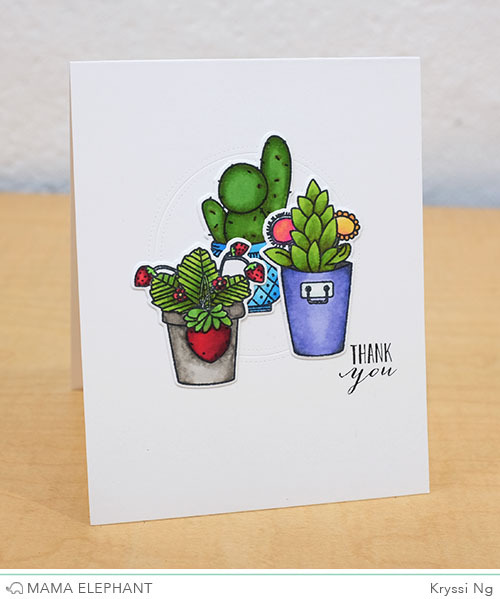 Elena is also hosting a giveaway for a set of Potted Pretties! Here's a quick card I whipped up, without using the faces. I created an embossed circular focus point using one of the dotted circle dies from Sew Fancy. Potted Pretties can be cute and elegant!!! Here is another card by Angela. She colored one of the images with some favorite Staedtler color fine liner pens. Remember to head over to Elena's blog to let her know how much you love this set! See you tomorrow as we introduce another set! Adorable! I just love these! These are outstanding! I can't wait to get my hands on them!!! Welcome Spring!!! Love the cards too! So cute! I love their little faces! All cards created with this fantastic set are great. I love this set alread and can't wait to get my hands on it! Love this set, and your cards are just beautiful! cuteness overload...love these potted sweeties. Omg love this set so cute!!!! Very cute stamp & die set. This is such a great stamp set! I love that you can use the plants alone or add cute little faces! How darling these are! Love those strawberries! These are pretty awesome and I like them with and without the faces! A unique set that looks very versatile. Love the tiny faces though! Such a happy and cheerful set! These stamps and projects are all so darn cute and cheerful. 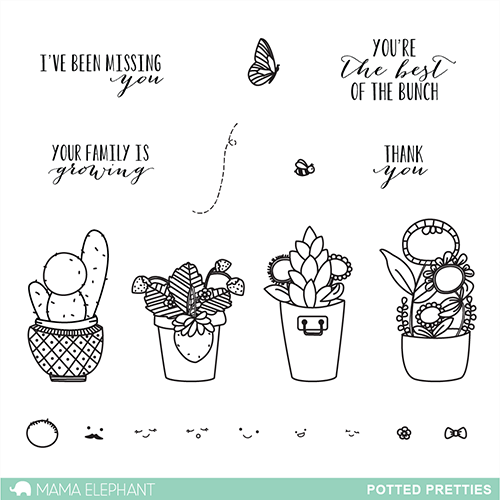 LOVE IT ALL, from the prickles on the cactus to the SWEET sentiments => CONGRATULATIONS on designing this SWEET set Elena!!! sooooo super sweet and totally cute. I really love the feel of this set. it's a nice chance from all the traditional floral sets out already out there. awesome card, therer are so beautiful! Oh my..this set is adorable, I just love it! Every new release from you guys is just better and better, there isn't a set and of course the matching die that I don't just love and NEED! What an adorable new set and beautiful card with the lovely cute flower faces. those little faces are so darn cute! Always the cutest stamps and great card designers!